Who comes to Religious Education? Our Religious Education program for children and youth includes structured classes for 3 - 5 year olds. Children and older youth will be invited to participate in worship, but also will have opportunities during the year for service projects. Diversity is a treasure that nourishes us all. Our congregation includes people from many religious and cultural backgrounds. We honor a variety of holidays, including Hanukkah, Winter Solstice, Christmas, Ramadan, Passover, Easter and Spring. What will my child(ren) learn? Unitarian Universalism is a liberal religion with Judeo-Christian roots. It has no creed. It affirms the worth of human beings, advocates freedom of belief and the search for truth. We affirm to provide a warm open, supportive community for people who believe that ethical living is the best witness of religion. The four basic themes of our program for Pre-K through 6th graders are: UU Identity and Heritage, World Religions, Judeo-Christian Heritage, Social Justice and Multiculturalism. Our Religious Education committee chooses curricula from the Unitarian Universalist Association that cover each of these themes in an age appropriate manner. Classes may include stories, arts and crafts, games, music, social action, long-term projects and the occasional field trip. Children and Youth are also given the opportunity to participate in the UU "Our Whole Lives Sexuality Education" (OWL), written at age appropriate levels. Click here for more information on OWL from the Unitarian Universalist Association. Parents are welcome to have their babies with them during the service, or to make use of our Nursery just across the foyer. We offer care in our Nursery for babies and children up to 4 years old. Two adult caregivers are always available. Our program for children age 4 through 8th grade is led by our Director of Religious Education. Our classes are organized by age level: Pre-K to Grade 2, Grades 3-5, and Grades 6-8. Children in Pre-K through 5th grade begin each Sunday in the main meeting room with their families. At 11:00 they go upstairs to the children’s Sanctuary for group Circle Time, and then to their classes. Parents are welcome to accompany their children, if they wish. Two volunteers from the congregation co-teach each class. At 12:00 a snack is provided in the foyer. The Youth Group, for High School aged youths, meets most Sundays from 6:30 - 8:30pm to worship, discuss important topics, participate in social action projects and have fun. They, and their adult advisers, may also attend district wide weekend retreats with other UU Youth. 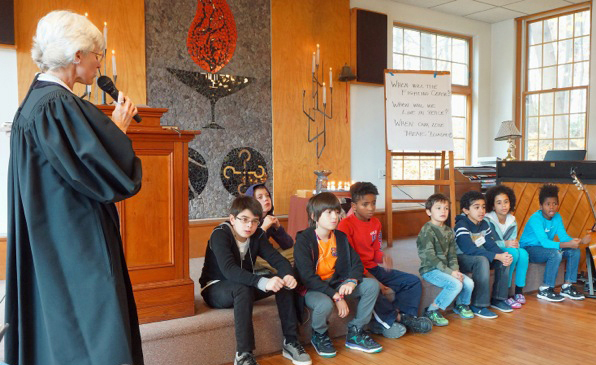 At Fourth UU, our religious education classes are free of charge. We do, however, ask that you register your child(ren) in the program by their third visit. Please see the Director of Religious Education for a registration form. What will be expected of my child(ren)? In order for all the children to get the most rewarding experience from religious education, regular attendance is crucial. Other than that, arriving on time and with a good attitude is just about all we expect. A child who routinely misbehaves in class may be asked to sit with their parents for the remainder of the class session. Also, please note that parents are responsible for their children before and after worship services. Any special needs are handled on an individual basis. Please feel free to share any pertinent information with our Director of Religious Education. We will always do our best to accommodate every child. How can I contact the Director of Religious Education? If you have more questions about our program or what you and your child can expect, you can contact our Director of Religious Education at any time by filling out the form below.